TUCSON, Ariz. -- Arizona has dominated its series against Stanford, playing well with good teams at times, getting a few breaks at otherwise. The Wildcats kept their streak alive behind powerful performances by their two big men. Ira Lee scored 16 points, Chase Jeter added 14 and Arizona beat Stanford 70-54 on Sunday night for its 19th straight win over the Cardinal. "Like any streak, there's always those moments where you just roll your eyes, whether the streak is against you or for you," Arizona coach Sean Miller said. "Like I've said before: the other 17, they don't help you win game 18. You have to do it all over again." The Wildcats (16-12, 7-8 Pac-12) played a solid all-around game to beat California on Wednesday and kept their momentum going against Stanford. Arizona jumped to an early 11-point lead and turned back a couple of Stanford runs to keep the Cardinal winless since 2008 in Tucson. Justin Coleman ran Arizona's offense well, finishing with 14 points and five assists. Jeter and Lee went right at Stanford's talented big men, shooting a combined 13 of 17 from the floor. "Ira has been playing the best basketball of his career lately," Coleman said. "I've seen him grow. I've seen him every day, extra shots before practice, after practice. I'm really proud of this guy." Stanford (14-13, 7-8) had some success shooting inside, but went 4 for 20 from the 3-point arc. Deajon Davis had 14 and Oscar Da Silva added 12 for the Cardinal. Stanford leading scorer KZ Okpala had 10 points after missing Wednesday's game against Arizona State with an upper body injury. "We dug our hole early and didn't really get enough momentum to gain the advantage," Stanford coach Jerod Haase said. "I thought our guys fought and fought the entire time. The big difference was early in the game and that really hurt us." 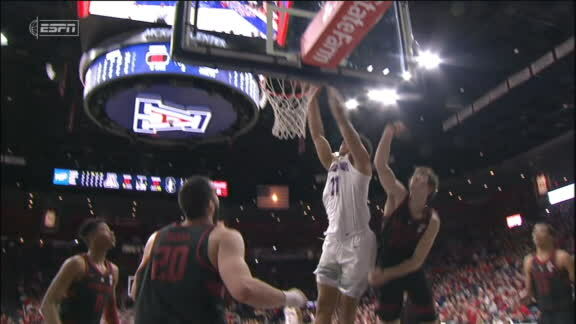 Arizona ended a seven-game losing streak with a 76-51 win over Cal on Wednesday. The Wildcats held the Bears to 30 percent shooting and found their 3-point stroke in the second half, making 7 of 16. Stanford had been on a roll, winning five of six before being run over by Arizona State on Wednesday. The Cardinal had a rough night shooting from the perimeter, going 2 for 21 from the 3-point arc, and allowed the Sun Devils to shoot 52 percent. Stanford's shooting woes continued early against Arizona. The Cardinal missed seven of their first eight shots, digging an 11-point hole in the opening five minutes. Stanford rallied to pull within three, but trailed 31-23 at halftime after going scoreless the final 4:10. The Cardinal shot far better in the second half, but so did Arizona. Stanford made an early run to pull within four, but the Wildcats kept draining shots to push the lead to double digits and keep it there most of the second half. Arizona shot 14 of 28 in the second half. "The vast majority of the shots we're taking are shots we need to take," Haase said. "We just need to start making them." Stanford's momentum melted in the desert with a pair of shaky offensive games. Not having Okpala against Arizona State hurt, but the Cardinal still struggled offensively with him back in the lineup against Arizona. Arizona appears to be back on track after an ugly stretch, playing well at both ends in a pair of victories. Arizona got a lift with the return of Brandon Williams. The freshman point guard had missed the previous six games with a sore right knee and coach Sean Miller wasn't sure if he'd be able to play against Stanford. Williams came off the bench early in the first half and played 17 minutes, 50 seconds, finishing with four points and three assists. "Even though he had a small role tonight, you could sense it was a shot in the arm," Miller said. "He gives us some much-needed depth and equally some much-needed firepower. We're a better team with him for sure." Stanford hosts Washington State on Thursday. Arizona plays at Oregon State on Thursday. Justin Coleman misses a layup, and Ira Lee crushes the putback dunk.